Posted by B. Daniel Blatt at 1:54 pm - November 29, 2012.
in our society, we are inundated with unwanted solicitations. Yesterday, for example, except for a magazine, every piece of snail mail I received was a solicitation for a charity, only one of which (to the best of my recollection) I have ever supported. 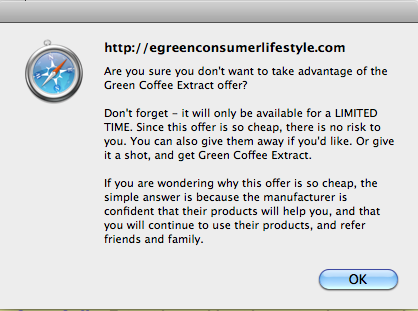 Every morning, it seems there are at least 20 unsolicited offers/advertisements in my e-mail, then it’s the Pop-ups. I really should use Firefox more often as that web browser is better at blocking them, but our GayPatriot dashboard is easier to use on Safari. This ad will make not make it any more likely that I’ll respond to their offer. Umm, I prefer my coffee black. No sugar. No cream. No green…extract. If your getting popups on your desktop you best switch to a better anti-virus. Popups in your browser can be virtually eliminated with a HOSTS file. I don’t get many pop ups, but I absolutely hate the new trend in ads where a video or audio plays and there isn’t a button to make them stop (other than turning the sound down). I don’t mind a video ad say at youtube where they sometimes play ads before videos, but when I go to a blog similar website I don’t want to listen to an ad that I can’t always find and has no shut off button. As people become more resistant to advertising, advertisements get more intrusive. Will business, at some point, figure out that they’ve hit the point of diminishing returns? The latest trend on the radio is for the announcer to have an extremely weird and annoying voice. There’s some outfit here in KC (finance, I think… I hit mute as soon as the ad comes on) where the announcer sounds like a parody of Truman Capote with a bad head cold. Love them…. but National Review, HotAir & RedState are the WORST lately when it comes to pop-up ads. Mostly self-promotional stuff too. Fox News may be approaching that. It’s not unheard of for them to run a reduced commercial news program when they’re covering something greatly important. This may be the extent of it for awhile, but the precedent is getting set. “Don’t forget — it will only be available for a LIMITED TIME.” If only. I just received my umteenth recorded “second and final notice” of an opportunity to lower my credit card rate (I always pay my credit card IN FULL). When I tried to complain to the live representative, she hung up on me. Better things to do than listen to a complaint, I’m sure. I won’t even go to NRO any more because of the popunders… not even for Jonah.